OK – in line with the previous post – another totally out of the court post for yah. 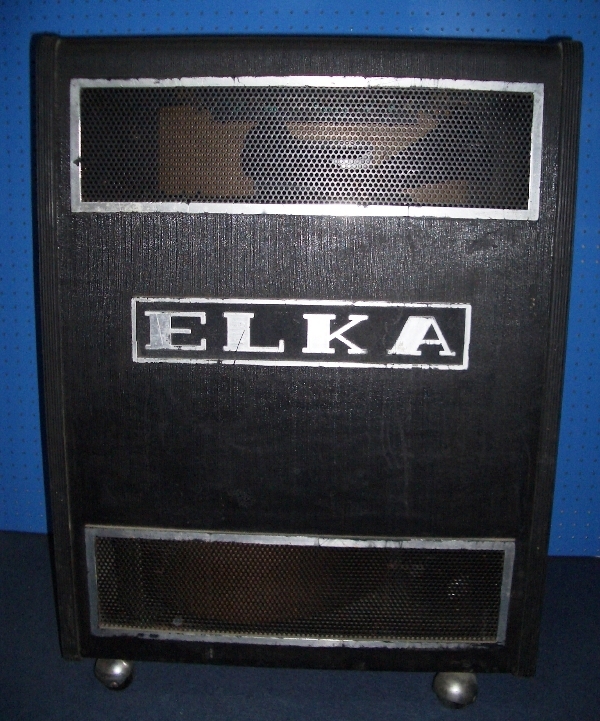 You see yesterday morning I managed to score one of these amp/speaker combos – a classic from the 80s – link to thrifty vinyl you ask ?? Normal service will be resumed once I stop annoying the neighbors/wife/kids .. The rest of the LP is to put it mildly a very mixed bag – including a rather creepy ‘Greensleeves’ where for some unkown reason the bass player thinks it is funk-track whilst everyone else sticks to smulch !! Also contains a couple rather pitiful Beatles covers – but a rather rousing ‘ Day by Day’ (orchestral-stylee).. !! 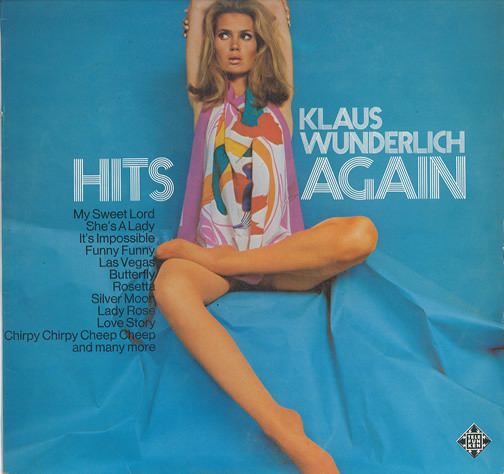 No semi-naked gals adorning this one – no sir – this is the real deal – old Klaus is given 4 sides to show just what he is capable of – hit it baby – make me swing !! Using nothing more than his bare-hands and a well greased and expertly programmed Hammond – he woos the crowd – cheering, dribblingm and maybe even moshing – into submission with a batch of favorties from the sublime ‘Mull of Kintyre’ through to the stomping-disco-joy that is ‘Disco-Time’ … oh how they rocked back in the day ..
A blistering trawl through a selection of styles ranging from uptempo Latin, Swing, Big Band and Smooch (if there is such a thing) – every bachelor pad should have this side – by law !! This is where the fun begins – combining the (lets face it here) rather limited tonal capabilities of the Hammond – with the untamed savagery of a Moog Modular – Klaus at times seems to struggle to control the wisps, farts, burps and blips of white/pink/filtered/distorted and just plain daft Moogisms. 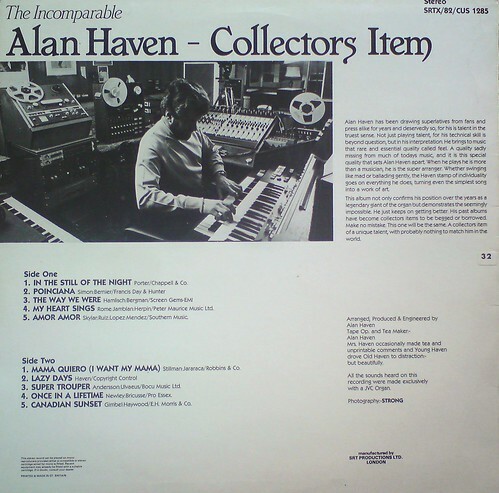 Some very cool and damn funny bits here – which make the whole thing a total joy to these ears .. For sure he is no Tangerine Dream imitator on this – but forcing electronic experimentation upon the easy-listening masse of 1978 deserves a loud letting of white-noise hiss at the very least – another classic no less !! Yikes – that’s what I thought – and indeed that is exactly why I bought this cheese-cake of a disk during my short holiday in that Mecca of middle-of-road-mayhem that is Ross-on-Wye. Lets face it now – if you had a grin like that – would you let it be used on your LP – not once mind – oh no – but using state of the art 1975 technology – see how they have cleverly managed to get it on there twice . Another fine release from the mighty powerhouse that is MFP. 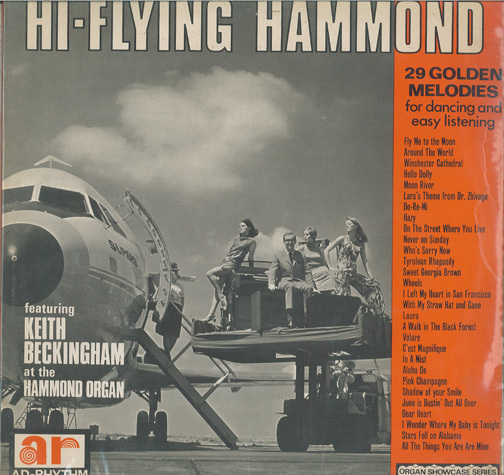 Come on up – and fly the skies – simply slap those beauties along with a well-tuned Hammond onto the wing – and soar away – in a flashing of footsteps to that crazy-Hammond sound. before all that rock-debauchery of the late-60s/70s – seems the real-rock-n-rollers with a bevvie of gals at every airport – were the Hammond-Masters – making them drool and drop at your feet with such classics as ‘Swing Wing Latin Hammond’, ‘Passport to Pleasure’, and not forgetting ‘Aerobatics on the Champagne Flight’. 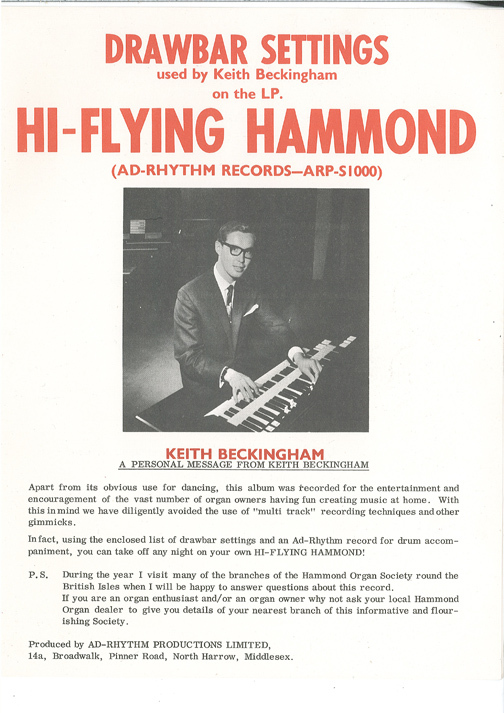 This is actually the precursor of the modern sample-disc – as it comes with the following accompanying brochure – allowing you to recreate all the sounds for yourself – on your very own Hammond. In addition to this important set of instructions – there are also 3 sample LPs of pure drum rhythms – allowing you to improvise along to. And… let us not forget – that also available on the Ad-Rythm label is: ‘Mellow Fruitfulness – A Whiter Shade of Pale. Time for further crate digging me thinks – a timeless classic !! 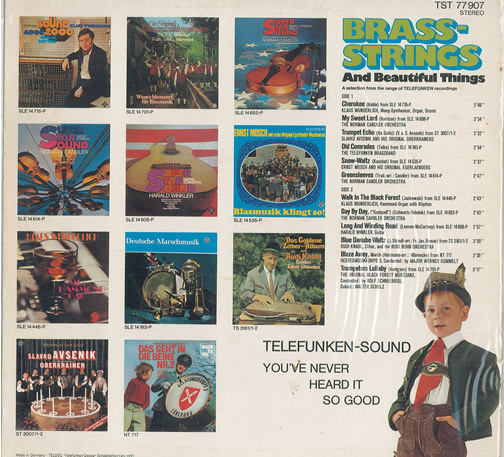 Another platter by the mighty Mr. Wunderlich on the equally mighty Telefunken label – this one being pushed in 1971. Now as my knowledgeable partner has previously pointed out Klaus is indeed a wizard of both technique and production. I am more fond of his later discs that dabble with sometimes strange sounding Moog effects. This probably due to the year and the fact it contains ‘Hits’ of the period – is alas a pretty dissapointing listen – lets face it – there really is nothing that exciting about a run through of classics such as ‘Chirpy Chirp Cheep Cheep’, ‘Knock Three Times’ etc etc – alas – the sleeve is what obviously grabbed my eye – and who wouldn’t want to grab this one for a mere 25 new english pennies !! 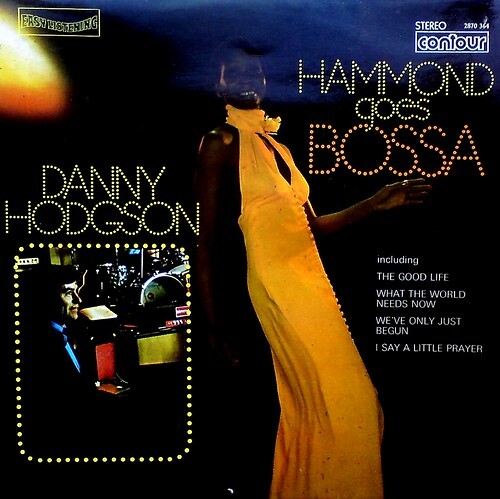 Following on from another previous post, this week I discovered a second album by Hammond maestro Danny Hodgson…and what a scorcher it is! 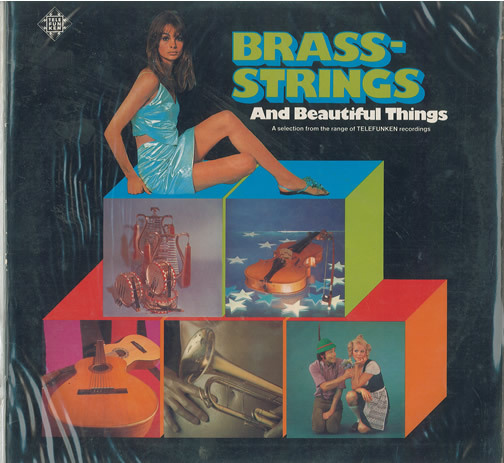 Wheras the other album had a somewhat thrown-together feel, with Danny backed by a basic rhythm section, this is a full-blown easy listening extravaganza, arranged by one Pete Smith, featuring full backing band plus strings and all manner of persuasive percussion instruments. Best of all, this is one of those records that looks to me like it’s never been played, resulting in a super-clean, crackle-free listening experience that totally belies it’s 35 years of age. Danny (photographed on the sleeve performing at the Circus Tavern, Purfleet) avoids the usual latin repertoire, preferring to adapt popular tunes from the likes of Burt Bacharach, Paul Simon and George Harrison. Still, I find the choice of cover-girl somewhat curious. Surely the obvious choice here would be a lady of Latin ancestry, rather than African. Makes me think that whoever at Contour Records chose the sleeve image (with a brief to come up with someone ‘exotic’) didn’t have the slightest clue what they were doing. 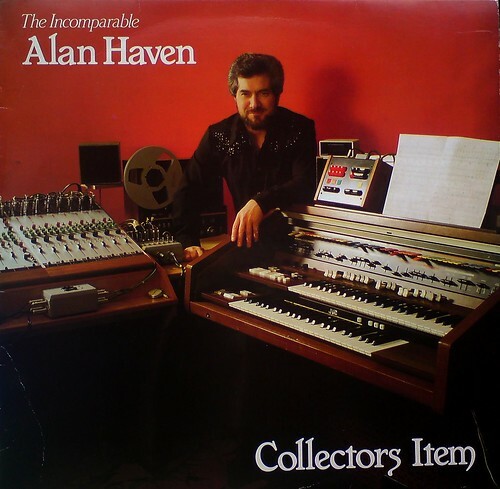 A surprisingly cool-sounding Hammond collection, played by Brian back in 1975. Some nice covers, some quite funky even – this being due to a quite excellent un-name-checked session drummer – who drives things along in fine fashion. 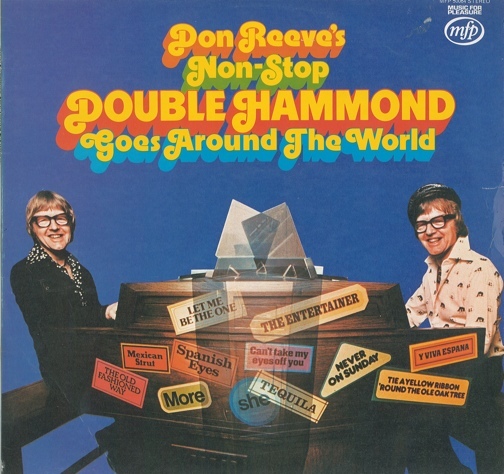 At times it heads in the cheesy-pre-sets direction – but on Misty and Light My Fire – the arrangements drag the LP back from bottomless pits that most of these Hammond collection wallow in. The cover being an acid-fried picture of semi-nakedness is of course completely fine ! 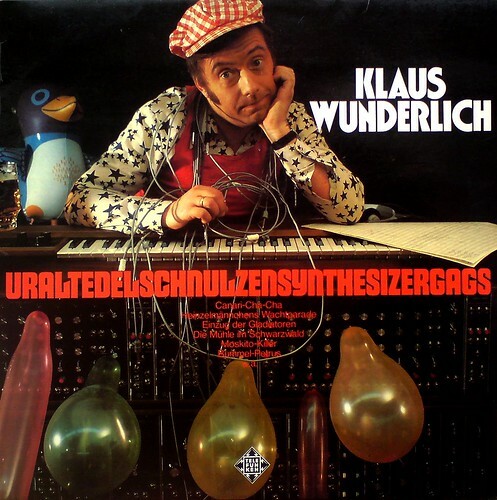 Can’t believe this blog has reached it’s third month of existence without yet mentioning German keyboard legend Klaus Wunderlich. I have a couple of older relatives (one of whom is himself a semi-pro organist) who revere Klaus as some sort of God. The thing you have to realise is that this guy set a benchmark for technical excellence (both as performer and engineer) which, to the best of my knowledge, has yet to be equalled, let alone surpassed. Of course, not all of Klaus’ albums are equal. I generally look out for the original German issues on the Telefunken label. 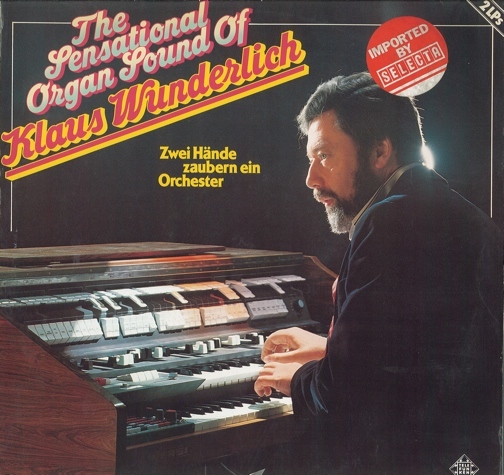 And, although he is best known as an organist, Klaus also dabbled with a giant Moog modular synthesiser, most notably on the Sound 2000 series, but also on this one called (deep breath) ‘Uraltedelschulzensynthesizergags’, which also clearly demonstrates Klaus’ natural technical abilities as he expertly wields the patch cords, coaxing all manner of strange tones from the Moog, proving not only his mastery of the instrument, but also a roving creative spirit far in advance of any other artist in this field. And the synthesized bird-calls on “Canari-Cha-Cha” would probably even impress my bird-song loving colleague.